Mike and Kelly's wedding was an extraordinary day. As I drove from Bend to Sisters, all I could see was a plume of smoke from the Milli Fire burning 10 miles outside of Sisters. For a brief moment, I was saddened. Everyone wants their wedding day to be perfect and I truly want my client's day to be perfect too. 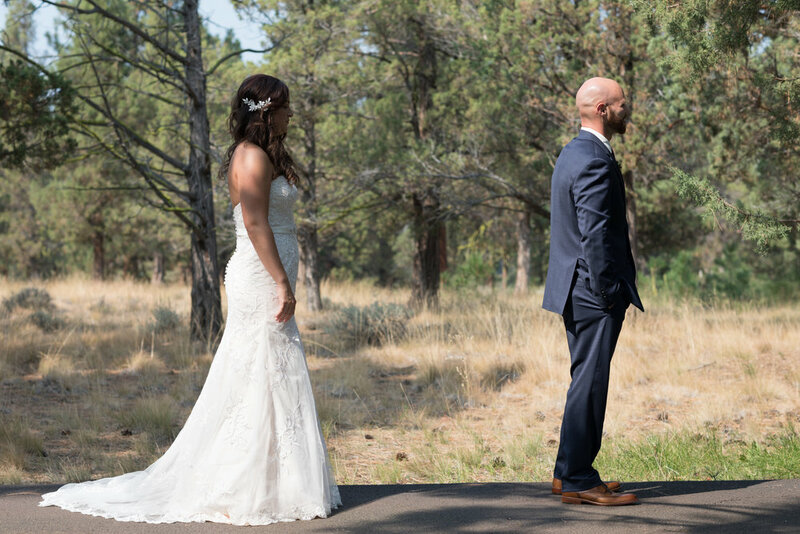 When I arrived at Aspen Lakes Golf Course, everyone's spirits were high, the mood was electric, and I knew this wedding was going to be everything Mike and Kelly wished for! After all, it's not about the what happens to you in life, it's about who you surround yourself with and how you chose to face each moment. The Conors and the Knights brought the party! A beautiful and rustic scene - even if the Cascade mountains were missing. As the ceremony drew near, the sky began to shift from a smokey haze to blue skies! And we all stood in amazement of the first beautiful Central Oregon sunset any of us had seen in months. Thank you all for making this wedding so special. The Bryan wedding was particularly important to me. Not just because they are a beautiful couple, who is very much in love. Or even what a privilege it was to be there, and capture that love on their very special day. It to me, is a turning point in my career. After nearly two years of dabbling in nuptials and engagements, I realized that I want my main focus on wedding photography. The Bryan wedding was my "coming out" party, as it were. All of my hard work is paying off, and the response thus far has been tremendous! I was featured in this year's Cascade Wedding Guide and am currently in talks with another wedding publication. With the Bryan wedding, I have put myself on the map and established my style of photography. As you can see, I prefer to use warm tones and an abundance of light in my images. This differentiates me from a lot of my peers, who are trending towards darker and more contrasted images. I would love the opportunity to be your wedding photographer! Please check out my investment page for package pricing, or head over to Facebook to read rave client reviews. I just returned home from an amazing week in the Black Rock Desert of Nevada. This image is from a time-lapse I shot on my new Sony A7RII, the cold desert night sky over Nevada seemed larger and more alive than almost any other I can recall. More to come from this trip very soon.